Would your business benefit from owning mishap.com? If you are interested in purchasing mishap.com, please contact us at sales@safetynet.co.uk. 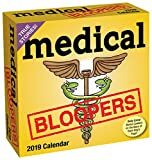 The Medical Bloopers desk calendar is a fantastic item to keep medical professionals amused through 2019. Daily pages feature real life blunders for you to enjoy, along with the date and room for jotting down notes. 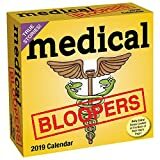 Please note: mishap.com lists products sold via Amazon.co.uk. Please check product suitability before ordering. ©2019 - mishap.com is owned and operated by SafetyNet Systems Ltd.